John Sato, 95, one of only two Japanese soldiers in the New Zealand army in World War II, took two buses from Howick to participate in March against racism at Aotea Square on March 24, 2019 in Auckland, New Zealand. 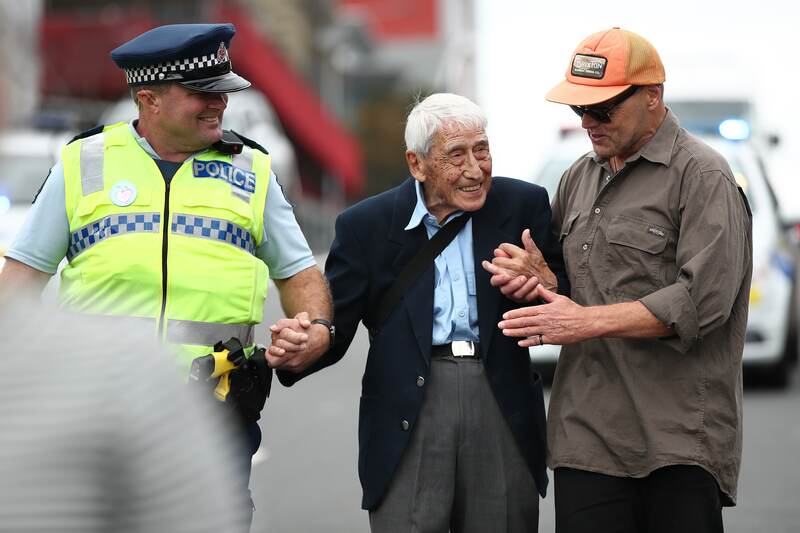 A 95-year-old veteran of the Second World War reportedly rescued four buses to join a solidarity fight against racism in Auckland, New Zealand this Sunday in response to the Christchurch mosque attacks. John Sato, 95, Howick, told Radio New Zealand (RNZ) that he has not been able to sleep well since March 15, the Christchurch attacks, where a 24-year-old white supremacist was fired in two mosques. in southern New Zealand, killing 50 Muslims. "I became very awake at night and I didn't sleep so well since then. I thought it was so sad you can feel other people's suffering" Sato said. World War II veteran who admitted rarely leaving his neighborhood in Auckland suburb Howick left his home at 10am to travel by bus to neighboring Pakuranga suburb. 15 minutes to pay his respect in a local mosque. Escaped by the many flowers and messages, Sato decided to jump on another bus to a march against racism in the city center approx. 45-50 minutes away depending on the bus route. Two bus transfers later, and Sato arrived at the Aotea Square rally, the New York Post reported. Sato, whose mother was Scottish and father was Japanese, was one of only two kiwi-Japanese recruits to fight in Second World War against Japan. Although he told RNZ, he lost touch with modern life, Sato said he felt compelled to participate in the fight against racism. "I think it's such a tragedy, but it has the other side. What their race or something. People suddenly discovered that we are all one." We love each other, "said Sato. John Sato, 95, one of only two Japanese soldiers in the New Zealand Army in World War II, took two Howick buses to march in March against racism at Aotea Square on March 24, 2019 in Auckland, New Zealand. Although many people were amazed at the 95-year-old commuter in March, Sato shot that the bus was a piece of cake compared to walking. At one point, the veteran was photographed and assisted by a police officer called Constable Rob and actor Bruce Hopkins, best known for playing Gamling in the film trilogy "The Lord of the Rings". "Sitting in a bus is much more comfortable than walking," he said, funny. "You know you're just sitting back and you're sitting comfortably and you're feeling lazy. You're brought together, you don't have to go. It saves your shoes." Sato lost his wife 15 years ago and His daughter, who was born blind, died last year. The 95-year-old's journey home was easier than the way he came. A police officer "took me all the way home and waited down there until he saw me up the stairs. Very kindly you know," Sato told RNZ and added "The tragedy in Christchurch – see what it brought out in the people. It shows the best of humanity." Sato said life is too short to be wasted on meaningless things like hate. He said he hoped the Christchurch tragedy was a wake-up call to many to make an effort to understand people of different backgrounds. "We all go through our furnace in some ways, and some of the things that happen to us will make you more understanding, I hope," said Sato to RNZ.